By now, I’m sure you are wondering why I would blog about beads, little small plastic ones you string for a bracelet or necklace. 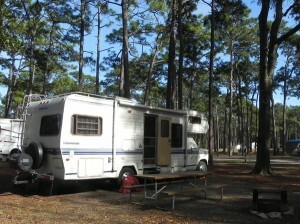 We arrived at little Talbot Island SP and once we set up the campsite, we sat off on a 1.2 mile hiking trail. It was a very nice trail and as we got back to the entrance of the trail, I looked down and noticed a little red bead on the ground. Hmmm, made me wish I had brought along my beading kit. I figured some little kid must have broken their bracelet. Once I examined the little red bead, I laid it back down on the trail for some one else to find and wonder. (as if someone would). Then, several days later, we arrived at Crooked River SP, and after we left the trail we took a short cut behind the cabins in the large grassy area. I stopped and looked down, and there lay another little red bead! I picked it up and said, “wow, what’s the odds of that!” So, I put the little red bead back down in the grass and moved on. Once we got to Fort McAllister SP, we got the camper all set up and sat down at the picnic table just talking about the little red beads! It was weird to say the least. Two different parks and one single little red bead lay in our path. We figured what a coincidence! Maybe it was a sign! But, if it was a sign of something, what? Maybe, it’s just some little kid that keeps breaking her little bracelet and Momma should string it with something stronger. And, why are they camping just ahead of us on the same route? Those separate little red beads in different locations sure got us speculating for sure. Well, if the little red beads had a meaning, other than some careless kid camping just a head of us, or perhaps they were a sign we were not headed in the right direction, who knows. But, during our conversation, guessing if these red beads had some meaning other than the obvious, what was it? Then, John looked under the picnic table and said, “honey, look!” You guessed it, beads again. But, this time there were 4 white ones and 6 green ones. Little small plastic beads just like the previous little red ones we’d found at two different parks. Okay, by this time, we started to think this is really getting weirder by the moment. Keeping in mind, that in all the foot steps we made at these three Parks, what are the odds that we would stumble upon one red bead at the end of a trail, one red bead in a large grassy area, and 4 white ones with 6 green ones under a picnic table? Since then, no other beads have been found. Not a single one. Neither one of us believe in signs, for the most part. But, after the beads incident, we now wonder. If finding those beads meant something other than some little kid loosing them all the time and the odds of us stumbling up on them in three different parks, I find incredible. Either way, if I find another one of those little beads, I’m gonna freak! I got you Mutha Fuka! March 14, Watson Mill Bridge State Park. I got you Mutha Fuka! It was a a busy day hiking a new trail at Watson Mill Bridge SP, we discovered a river with some great rapids and it was not the one you see flowing under the Bridge at Watson Mill Bridge SP, but behind the campground. We were worn out by the time we got back to the RV. We built a roaring fire in the fire pit, the grill was all set up and we patiently waited for dinner. We noticed our screen door was covered with flies! Must have been that Pork Tenderloin on the grill that got em. Either way, it was now all out war, but first, I’ll set the scene. As we retired for the evening indoors, we relaxed to a nice glass of Moonshine! Yes, you heard it right. We’d bought two mason jars of it last year in Tennessee. It’s legal in Gatlinburg, but the taste should be illegal! A shot or two or three chased down with Orange juice, well, that’s all we had for a chaser set the mood. I’ll spare you some details, but the more we stared at those flies, the more irritated John got! After all, we both hate flies! We tried swatting them with a small rolled up towel, not successful. I tried the old shoe trick, left fly remains on the ceiling, not good. 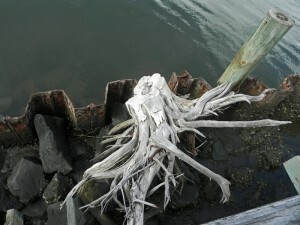 Then, John remembered the old trick he used back when he lived on a boat for nearly a decade! After all, one must entertain ones self when you are out on the Ocean and find your boat swarming with flies! Fill a cup with soapy water, about half way full. Wait until the flies land on the ceiling, then slowly raise the cup to about an inch from the fly, he’ll fly down into the soapy water every time. Well, most of the time, but that’s beside the point. The point is, it’s entertainment to say the least. But, when a fly two feet away from you flies straight in the cup you are holding up, well, it can’t get any better than this. But, the absolute best part of this story is when John drowned that first fly and said, “I got you Mutha Fuka! Now how do we dispose of these flies? We opened the door, reached the cup through the little slide on the screen door, and poured them out! Oh crap! John’s shoes were still out there in the dark by the steps, wonder if he missed the shoes? 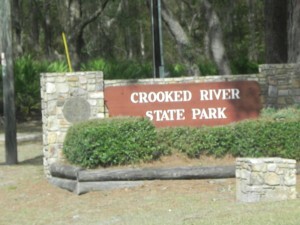 Crooked River State Park, Ga.
Crooked River State Park, Ga. Nice park, clean, large lots, picnic tables, firepit, limited tv channels, and if you have VirginMobile Broadband2Go, you will get a signal. Lots of places to hike, and it is a photographers dream for it’s scenic view! 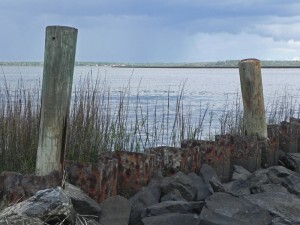 For more information, visit gastateparks.org!